The Coaching and Leadership course is going to be offered for the 2018-19 school year to allow students to experience leadership opportunities within our district and our Hilliard community. 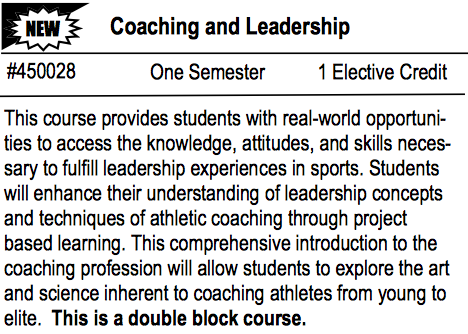 Leadership experiences with our athletic coaches are readily available and will be utilized, but this course will not be limited to the lens of sports. The course will be experience-based and will aim to expose our students to leadership roles as a potential career opportunity. Stay up to date with all scheduling information from all buildings on our scheduling page.